Sis and Company are a bit annoyed with me. Blessedly, It’s a good annoyed. They want me to scrap my plans to fly home today and continue the cross-country ride with them. I had waffled about it for a day or two but then a few factors with mom pushed me over to the other side and so I booked to fly. Fingers crossed folks that by mid-September we will be able to situate mom into her new home. That means, I’ll be back! But folks, I am mighty torn. Sis and company are going to enjoy some fine stops on their return to the east coast. From Carefree they will continue to the majestic and beautiful Grand Canyon (the place of my four-day camping adventure to the bottom of the canyon and back up again some ten years ago). Their plans include other interesting stops along the way in States that I have traveled through but not explored nearly enough. And the chance to spend more time with Alexandre-the-Greatest entertaining me in the back seat of their comfy car….well….I’m gonna truly miss that. Rocket-man had no problem with extending my time away from home. “This road-trip opportunity with your sis may not happen again,” he says. I prefer to think the opposite. We will have other road trips together…or vacations, at least. They were fun to travel with; I had a blast, experiencing some new sights and, more importantly, new cuisine along the way. But I am really gonna miss another chance to stop at a Dairy Queen with bro-in-law. Yes. I’m not happy to report that I’m returning home with a few extra pounds on me. I blame it on stress….and Dairy Queen. Mind you, as God is my witness, we only stopped at one Dairy Queen. We were two hours from arriving in Carefree when bro-in-law suggested we stop for a treat. “I’m ready for a Blizzard,” he said. “How about the rest of you?” Naturally Alexandre-the-Greatest was in happy agreement. “I haven’t been to a Dairy Queen for a least thirty years,” I say. “What’s a Blizzard?” I added. I might as well have asked what “color is the sun?”. “You’ve never had a Blizzard?” bro-in-law feigns incredulity…or least I think he is acting. “Nope,” I reply. “But I’m game”. And truth be told, I really was hankering for an ice-cream treat. I needed the comfort of gooey chocolate sweetness knowing that some difficult days were just hours away. So, I ordered the Chocolate Chip Cookie Dough Blizzard. A small cup, I reasoned, wouldn’t blow my calorie count for the day. And besides, we hadn’t eaten a proper lunch since we’d been in the car all day. So when my order was placed on the counter by the teenager at the register I was positive they had made a mistake. “I ordered the small size, not the large,” I said. “That is the small,” was the reply. I’ll just eat half of it…I cannot possibly eat it all. I enjoyed every last spoonful. There’s just one thing. I made the mistake of looking up the nutritional information once I was back in the car. Holy Stromboli! What was I thinking? There is a reason for that adage, ignorance is bliss. 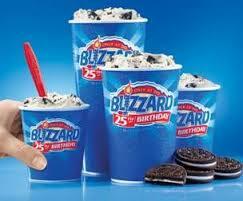 But for inquiring minds….the small Blizzard clocked in at 710 calories and 28 grams of fat. Yikes. If I would have ordered the medium, I would have put 1,030 calories and 41 grams of fat into my system. And the large? 1,350 and 54 grams of fat. OUCH! OK….I thoroughly enjoyed that Blizzard. But as God is my witness, it’s out of my system folks….for another thirty years at least….or well, until another vacation with sis and company. Blizzards. Thankfully its out of my system! Love the Heath Bar Blizzard, but like you, haven’t had one I decades!!!! OK. We will lose 5 pounds, then treat ourselves with a blizzard.